Inspired by ever-popular video games featuring epic clashes between the races of Men and invading Dark Elf troops, Great Wars gets you to choose the side – be the mythical Elf princess or mighty King. This action-packed game utilizes Stakelogic familiar mechanics with 5 reels, 3 rows and 30 paylines bringing too much at the stake – 8000-coin jackpot and tools such as Double Wilds, Scatter and Free Spins to help you defend the throne. You can play for fun or for the real money, but first, read the Great Wars slot review and get some proven tips. We have no free play mode available yet, but take a look at the Great Wars screenshots instead. Or why not simply giving a try with one of the recommended casino sites above? The first choice you have to make is will you play for fun or for the real money. Another good thing is the Great Wars free play is enabled by default on the Stakelogic-powered sites allowing newbies to learn how to win with no additional costs. No matter what, the game offers a wide variety of betting options thanks to the coin denomination going from as low as €0.01 up to €0.50. According to your strategy, place bets between €0.30 and €240 per round and try to line up 3 or more matching icons in order to receive a payout. Double Wilds of 2 kinds can increase your winning odds by creating high-paying combinations. Both the king’s shield and the Queen's shield have the same role when talking about the substitution of all other symbols but the Scatters. Just to point out that Scatters are needed to activate the Great Wars Bonus, while 2, 3, 4 or 5 Wilds pay 120, 800, 2.400 or 8.000 coins, respectively. Continuing from where we have left off, combine 2 Wilds and apply a 2x Multiplier to the base win. The paytable puts much trust in other themed icons as well, so King Morkas and Queen Vyldana pay 400, 160, 80 or 40 coins for 5, 4, 3 or 2 of a kind. 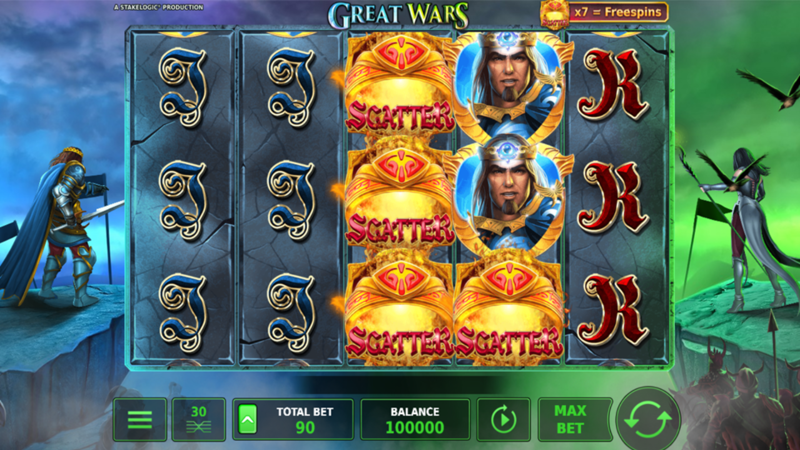 With 7, 8 or 9 Scatters appeared anywhere on the reels, you will get to enjoy 8, 15 or 30 Great Wars free spins, respectively. Scatters have an extra role to boost your overall rating: exactly the same number of those items also activates the Scatter Pays mode and grants 480 coins. During this round, all Wilds turn into Expanding Wilds to produce more winning opportunities. Play online using any modern mobile device as there is no need to download the iPhone app or the Android .apk file for this purpose. 3. What is the RTP factor of Great Wars? The RTP official info is 95.19% and is approved by the Great Wars test. Featuring visually-impressive animations, the game will actually make you feel like in the middle of a battlefield. Following that pattern, there’s also a war between odds that apparently was won by the house. Newbies are strongly advised to read the Great Wars tutorial and use all our tips in order to defend their stronghold.